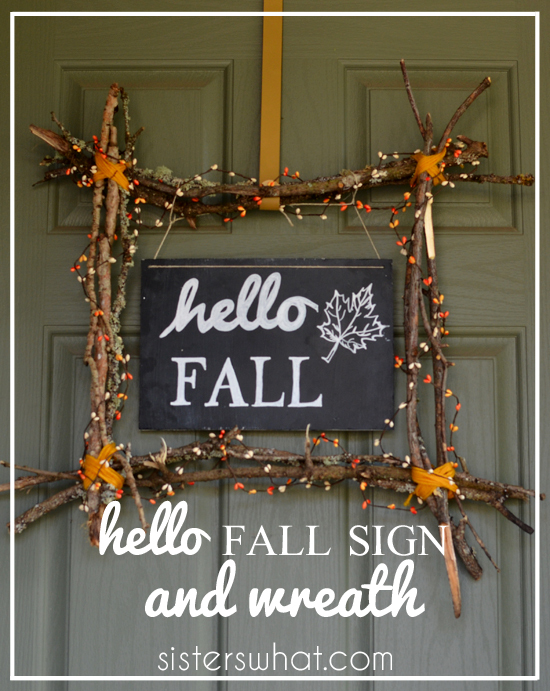 ' Hello Fall Sign and Wreath - Sisters, What! Are you totally ready for fall? I can't believe September is halfway over! I'm so ready for a change of trees, temperature and atmosphere. 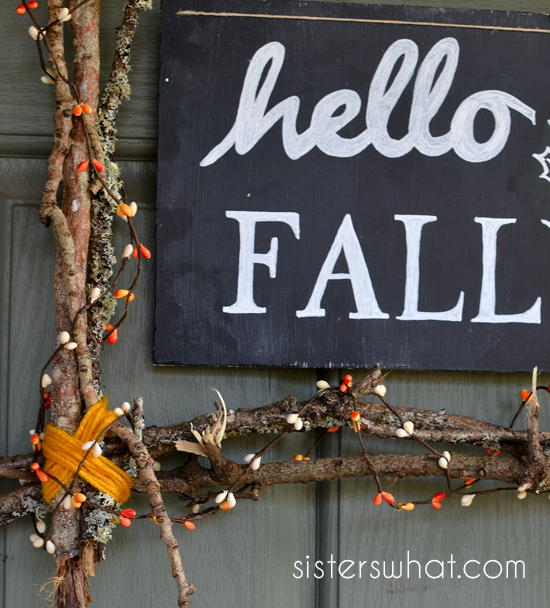 I really don't have many fall decorations, but I thought I could flip my front door hello sign over and make a fall version. I decided to do chalkboard paint and use a chalkboard pen to write my phrase on. Then I saw Kim's, from Made in A Day, Hello Fall Harvest Wreath and just loved what she did by making a wreath around a hello fall sign. I used sticks from the back yard and just love how it turned out. - chalk pen or chalk ink pen (I used fine point) or you can carve a piece of chalk to a fine point. - I used the Pacifico font for Hello and Thor for Fall ( or you can download a pdf document HERE or go HERE). |1| on the two top corners of your 8x12 plywood piece, drill holes. Then paint, or spray paint, your piece of plywood with chalkboard paint and let dry. 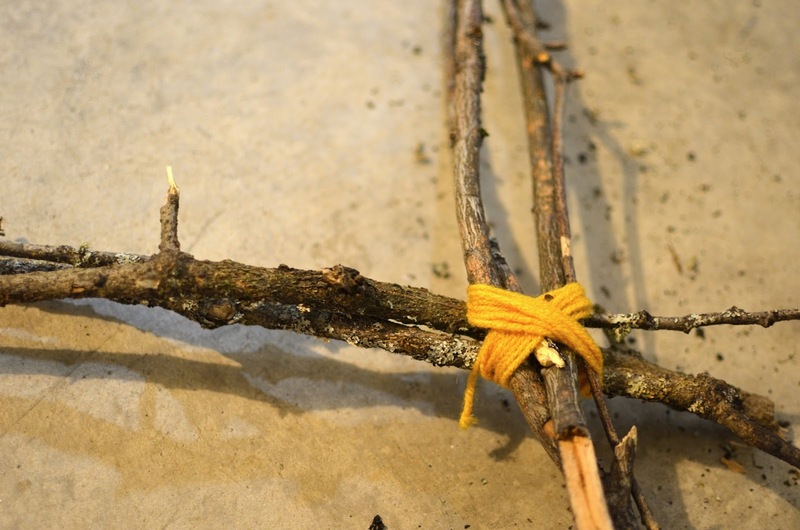 |2| Grab your sticks and place them in a rectangle around your chalkboard plywood piece. Your sticks should overlap at the corners. I had my two sides over lap the top and bottom. Then grab your yarn and start wrapping the corners together. Once you get all the corners you're done. Oh if you want the berries on there, go ahead and wrap them on there now. 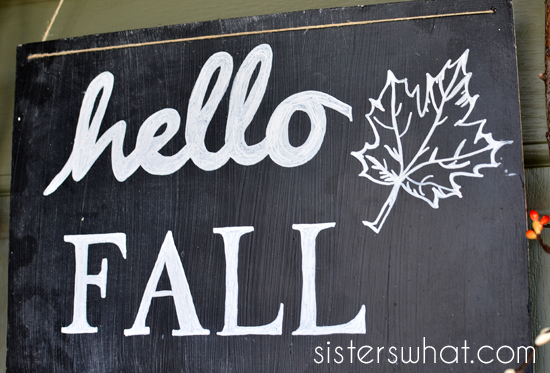 |3| Now get your printed hello fall document and your chalk pen or chalk. You could cut it out to make a stencil, or you could eyeball it and use it as a guide. I considered using my silhouette to cut out a stencil, but by that point I was half way through just eyeballing it. It was much easier than I thought. After you've finished, attach it to your stick frame and hang the complete wreath on the door. If you would rather, you could always get the completed hello fall print from our etsy shop and modge podge it on a piece of plywood or canvas. Great job. Looks super cool. wow, i love that! the little yellow touches in the corner are perfect. enjoy! Super cute wreath!! I love that it is square. I think the sticks make a great statement. Thanks for sharing! This is so so cute, Havalah! The sticks add the perfect natural touch! Thanks so much! the sticks are my favorite! If you do one yourself make sure to take a picture of it and tag us on social media, we'd love to see how it turns out! Love how this wreath turned out! I featured your lovely project this morning at our link party. Be sure to stop by and grab a feature button! I just saw this and thought it looked familiar! Lol! I love it! haha, I'm glad you were able to stop by. I just loved yours so much! 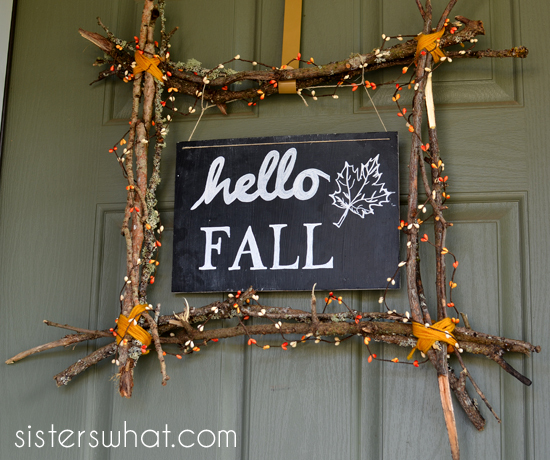 Such a cute fall wreath! I love the sticks!